Fleet management is becoming an important point of focus for finance directors, with an increasing number of companies seeking ways of reducing running and ownership costs. Rainer Mielke, director of global fleet at Škoda, explains why selecting the right executive car is crucial to a healthy company budget. How does Škoda choose to handle international fleet demands? Rainer Mielke: Our approach is two-fold. Firstly, we have a dedicated team at Škoda whose job it is to look after the international customers. And secondly, we have a very strong relationship with an organisation within Volkswagen called Group Fleet International, whose customer base comprises large international fleets. We work extremely closely with this part of the company. To what extent are finance directors becoming more involved in fleet management decisions? Finance directors across many companies are getting more and more involved. This is because the fleet itself represents a big cost share of the company, which customers are obviously looking to reduce. What this means in practice is that they're looking for low total cost of ownership (TCO), as well as low CO2 emissions and reduced running costs. It goes without saying that safety and reliability are crucial. This entails, on the one hand, maintaining mobility and avoiding breakdowns, and on the other hand reducing injuries and accidents. We are satisfied that Škoda is very strong in this area. How efficient are Škoda vehicles from a TCO and environmental perspective? They are very efficient. The Škoda Superb Combi is considered the TCO benchmark in Germany, the UK, Spain and France, and this is just one example. If you look at the other models, they are efficient both in terms of TCO and reducing harmful emissions. At the moment we offer one model with CO2 emissions below 90g/km; seven that are less than 100g/km; and 32 less than 120g/km. This helps us keep our costs down and shows that we are well on our way towards sustainability. The fleet market will definitely continue to grow, as it has in the past. Škoda's overall European fleet is 25% larger than it was this time last year and it is our objective to expand it even further. We plan to maintain our present level of development and bring out new vehicle models every six months. We are sure that, from the customer's point of view, environmental considerations will become even more of a priority in future, so we plan to introduce e-mobility activities. Škoda Auto has started production of a test fleet of ten vehicles for the Octavia Green E Line. Vehicles will be in cooperation with external partners collecting detailed information about practical usage, reliability and safety of electro mobiles. "Škoda’s overall European fleet is 25% larger than it was this time last year and it is our objective to expand it even further." Looking at the overall market, however, I think it's important to realise that the international fleet customer is principally looking for price and service consistency across countries. This is the most important goal for us, and we need to be able to fulfil it. What executive cars are most suited to the CFO of today and which of your vehicles were showcased at the Frankfurt Motor Show? The most suitable car will be the Superb Combi; it's our flagship vehicle, and offers tremendous roominess, quality, and low running and ownership costs, making it ideally suited to CFOs. In Frankfurt, we showcased Citigo, a new family of small cars due to be launched in the Czech Republic this November. One member of this family is the MissionL, for which we showed a pre-production version. The final version will come out this year in India and next year in China, Russia and Europe. It will be positioned between the Fabia and the Octavia and will meet all the requirements of our typical Škoda customer in terms of quality, roominess and reliability. We envisage it performing particularly well in emerging markets like India, China and Russia. 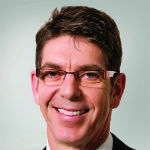 Rainer Mielke, director of global fleet at Škoda.